Four signs high atop One Times Square joined together to create a digitally-animated, multi-colored Christmas Tree. Representatives from Toshiba Corporation and TDK U.S.A. Corporation joined in a special “5, 4, 3, 2, 1” countdown to light the digital tree which appeared on the Toshiba Vision, TDK, and for the first time, Dunkin’ Donuts screens underneath the world famous New Year’s Eve ball, on Thursday, December 18. The digitally-animated Christmas tree, measuring 204-feet, was lit on the Toshiba, TDK and, for the first time, the Dunkin' Donuts screens on One Times Square.Encompassing four digital signs, and rising 400 feet above street level, the 204-foot digital tree utilizes state of the art graphic designs, designed for maximum visual exposure in Times Square. As it debuted, first seen in silhouette, a gradual pulsating glow behind the tree began, letting viewers know something special was in the offing. The tree began to sparkle, while another Times Square tradition, a special countdown, slowly appeared. As the countdown got to “1,” thousands of white lights shimmered, with the new rotating tree getting brighter and brighter in sparkling lights as a sash with “Season’s Greetings” enveloped it. 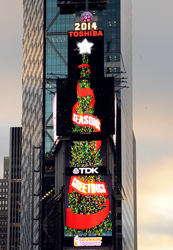 “TDK is always thrilled to be a part of this holiday tradition in Times Square, the magnificent digital Christmas Tree, which gives holiday cheer to all passing through the crossroads of the world,” says Frank Sweeney, President and CEO, TDK U.S.A. Corporation.